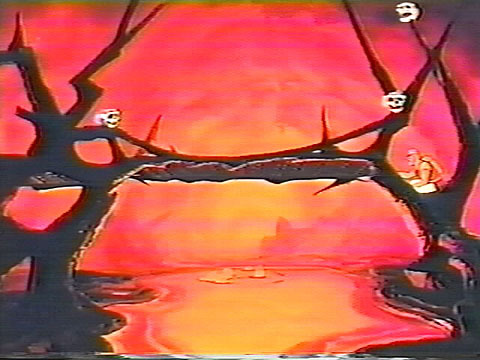 The cabinet and cabinet artwork went through a few changes before it went into final production. 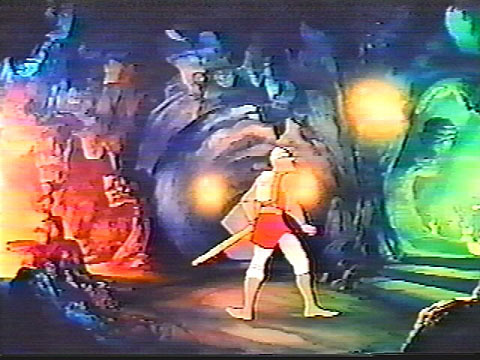 In the pictures below, we see a Dragon's Lair cabinet in its early stage. 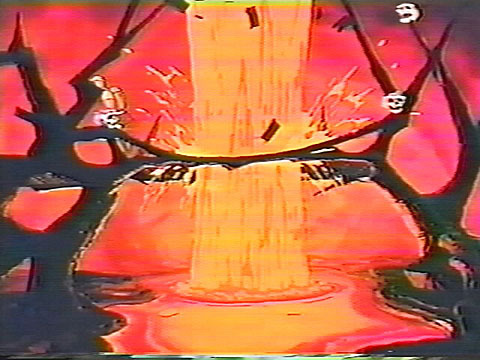 The control panel was all black with instructions on it. 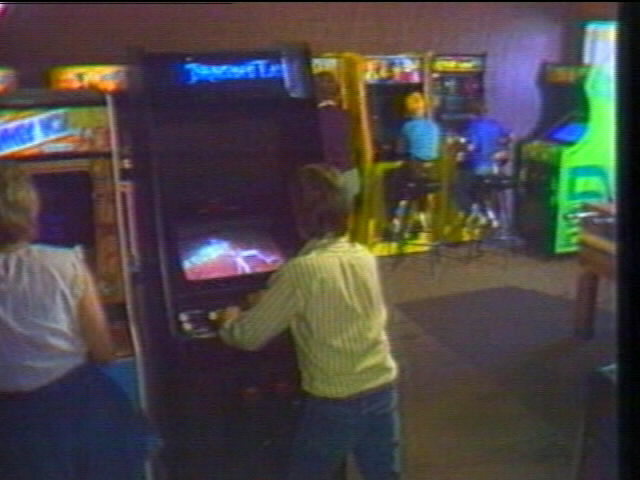 The score display only shows a single 4 digit score with lives in the center directly above the screen. 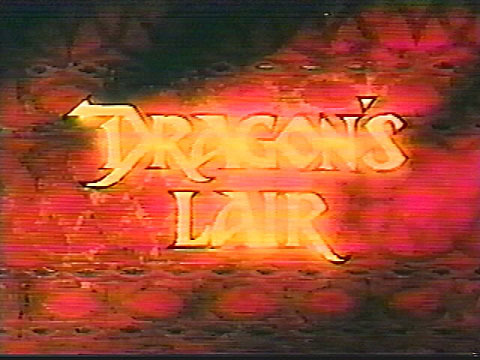 The marquee was a 3-sided marquee, but the words "Dragon's Lair" were written differently and the lettering was dark blue. 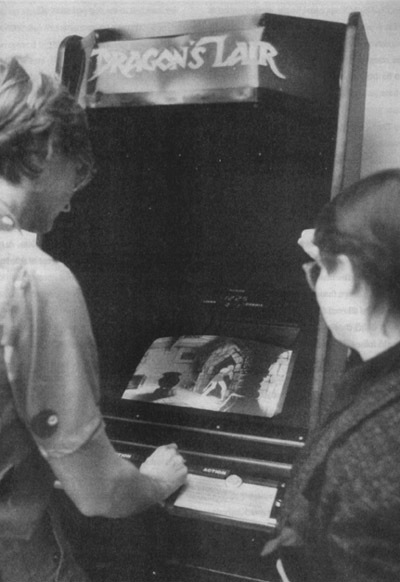 In the pictures below, we can see the game being play-tested in the office as well as out on-location. 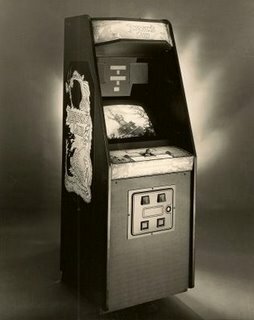 The cabinet eventually transformed into what we all know today. 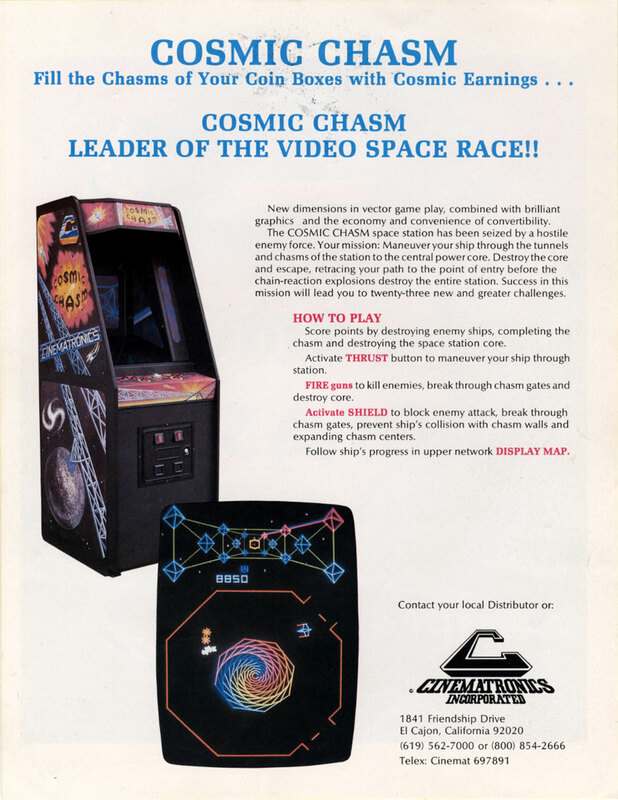 The cabinet design was very similar to what Cinematronics used their for Cosmic Chasm video game released the year before. 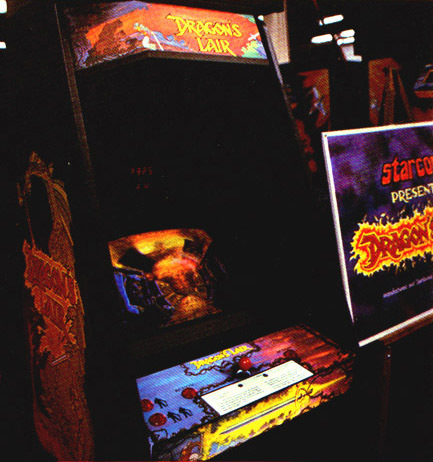 A few test Dragon's Lair machines used the same control panel as Cosmic Chasm before it was changed. 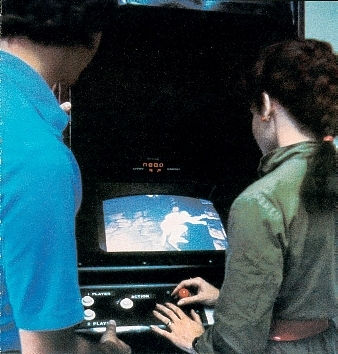 Both types of original control panels actually still had the instructions for game play on it directly below the joystick. 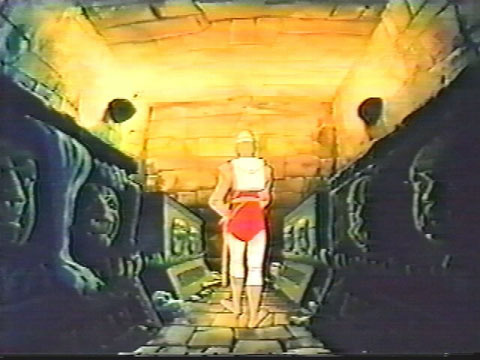 The instructions were later taken off the control panel and added to the laserdisc as part of the attract mode. 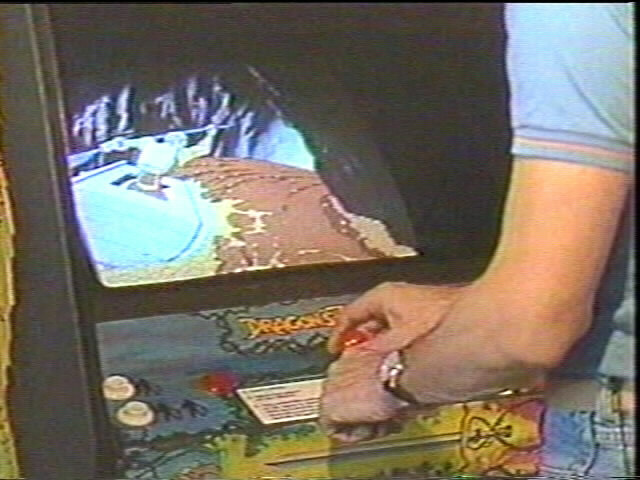 You can see in the images below the control panel with the instructions on it. 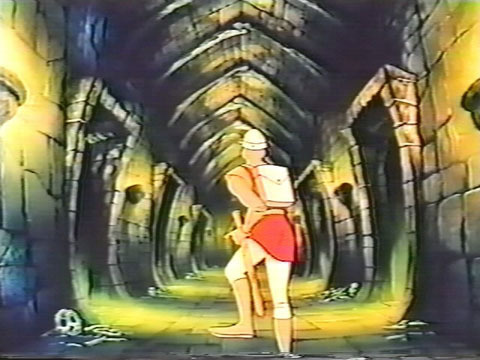 Originally, Dragon's Lair was going to be a little less constrictive. 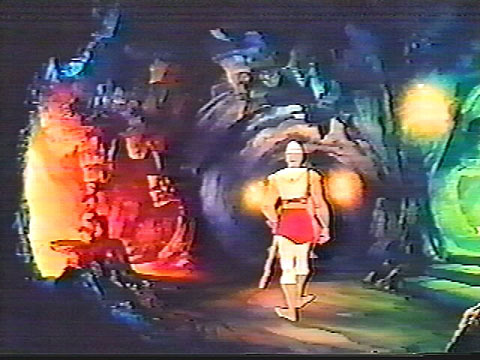 Multiple exits to rooms and different directions to choose in each room was normal for most of the scenes. 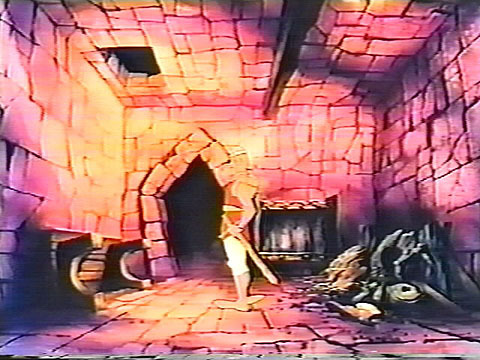 Below are a few of the rooms with differences. 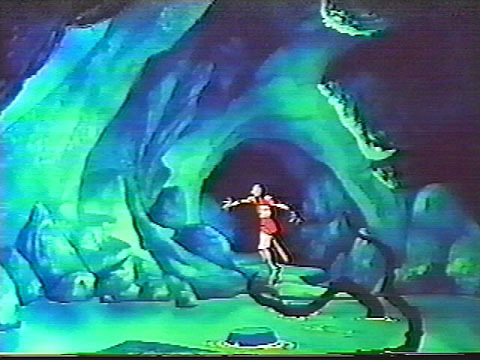 You can click on the images for a larger view. THE ATTRACT MODE - On this version, there were no overlaid graphics that listed the character names. 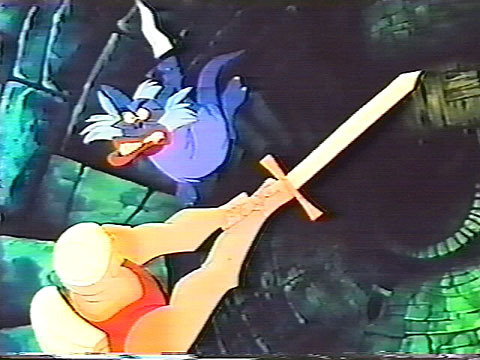 A Gargoyle with a spear appears midway through the attract mode. 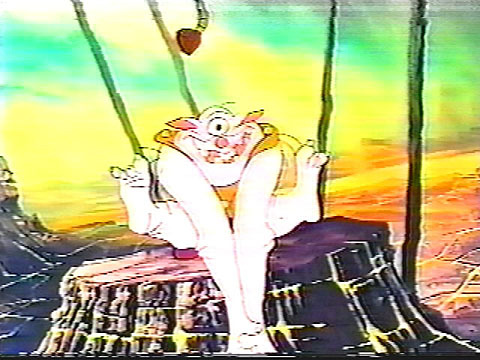 On the final pressing of the disc, the footage of this creature is replaced with the Lizard King. 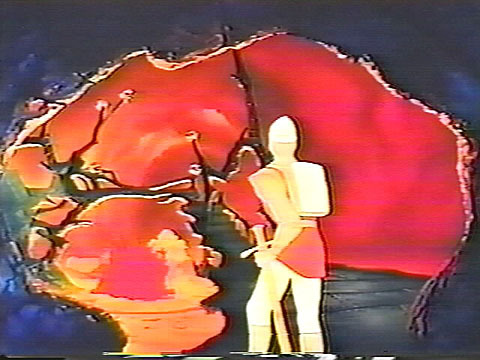 * If you listen very closely to the audio at the point of the Lizard King in the attract mode of the final pressing of the disc, you will hear a "swish" sound in the air when the Lizard King is shown. 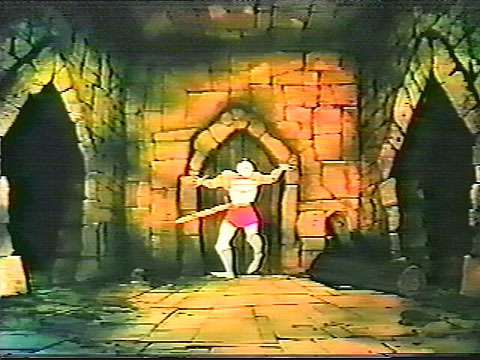 This "swish" is actually the sound of the Gargoyle throwing his spear. 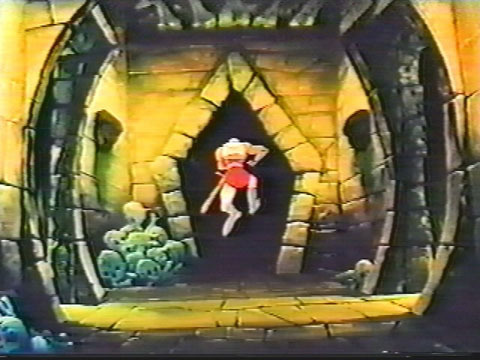 THE CASTLE - The scene starts off with the drawbridge and continues into the vestibule.  In this room, the ceiling does not crumble right away. 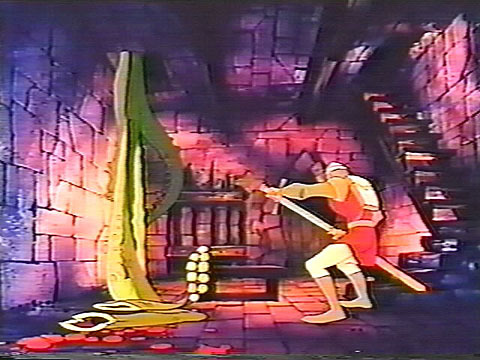 Dirk is given the choice of exiting to the left, right, or moving a log over and exiting through a small trap door in the floor. 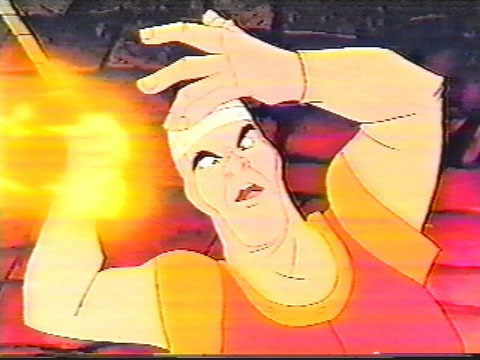 If Dirk stays in the room, the ceiling will eventually start to crumble, and he must exit either left or right. 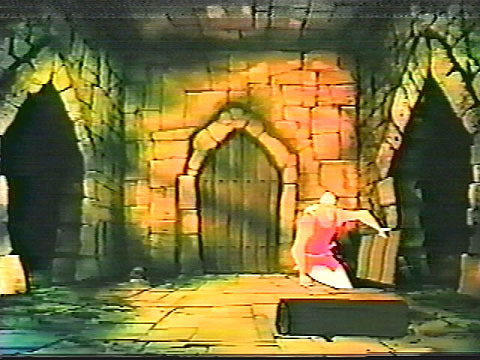 * If you look very closely at this scene on the final pressing of the disc, right before the floor starts to crumble, you can see the hole in the floor where the trap door was. 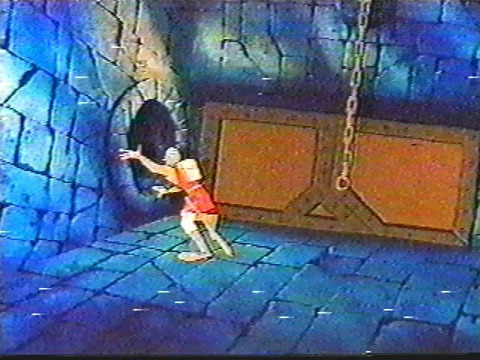 The animators took away the cel of the "door", but did not replace it with a cel of floor that would cover over the hole. 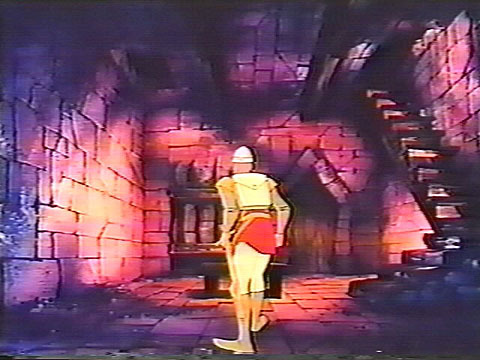 THE SPIRAL STAIRCASE - This scene starts off similarly, but Dirk must watch out for that first step. 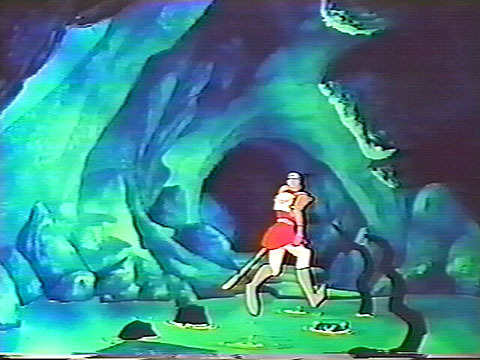 There is a red trip wire that, if stepped on, will send spears into Dirks head and chest. 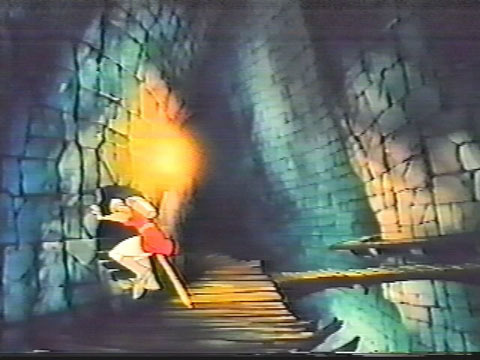 Also, the sound effects were a a bit different when the Giddy Goons were hopping around. 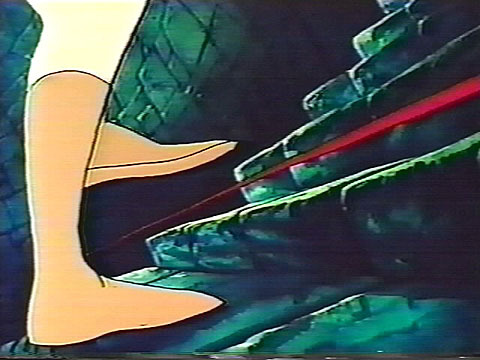 * If you look very closely at the death scenes on the final pressing of the disc, you will see the red trip wire by the first step. 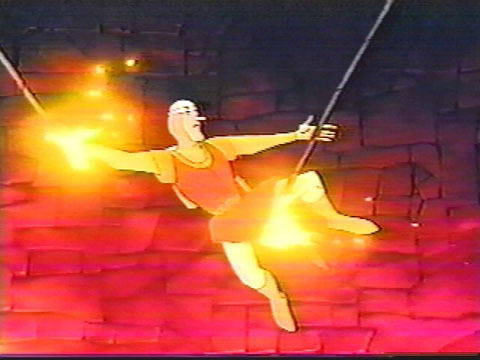 The animators removed this from the normal scene, but never removed it from the death scene. 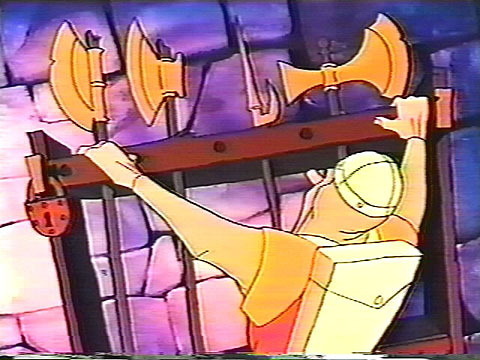 THE TENTACLES & HALBERD - This scene was pretty much the same for the most part, although there are a few small pieces of animation that were cut from the final release, like Dirk's attempt to remove the halberd from the rack. 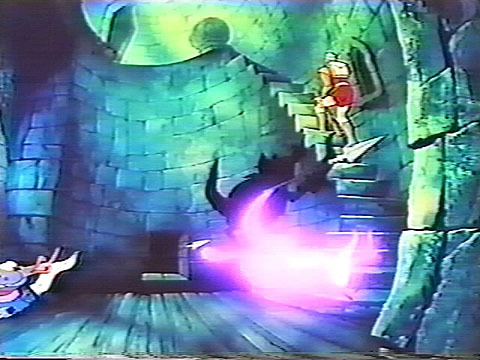 Some of the sound effects from the tentacle were a little different, and when Dirk slices through it with his sword, there is a little more blood shown while the loose end flops around on the floor. WIZARD'S CHAMBER - In this scene, Dirk walks into the room and sees the cauldron bubbling over. 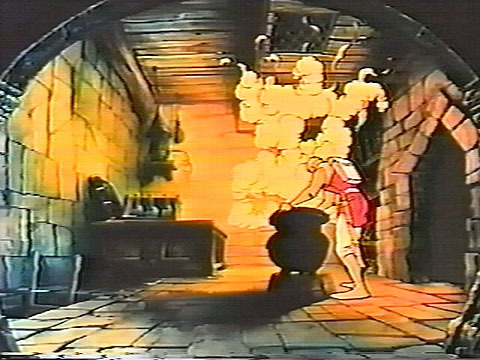 He can immediately grab the lid to the pot, put it on, and run out of the room. 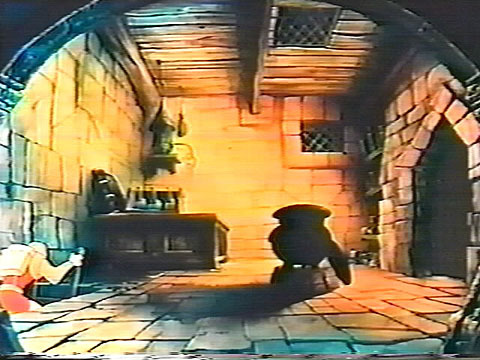 Another choice for Dirk would be to walk to the counter in the back of the room where there are three flasks of liquid. 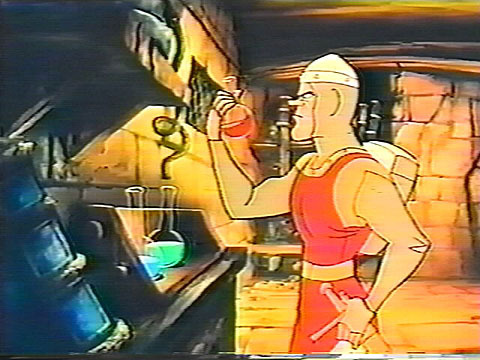 Dirk can either look at the flasks, drink the liquid out of another, or pour the contents of the third flask over his sword. 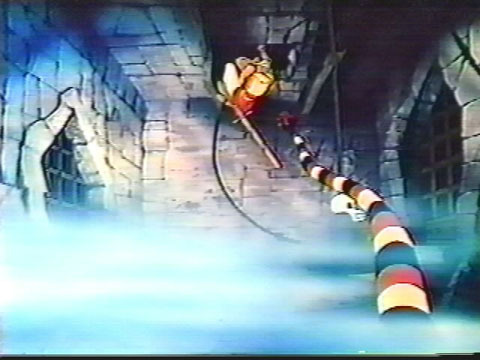 After this, Dirk can attempt to battle the Cauldron Wizard, then exit through the door on the right side of the room, or leave through the hole in the floor on the left side of the room. 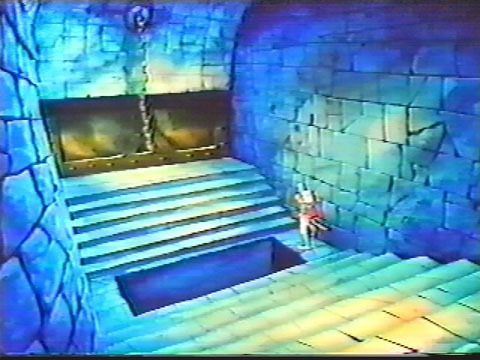 * If you look very closely at the "crumbling bones" scene on the final pressing of the disc, you will see the hole in the floor with the ladder. 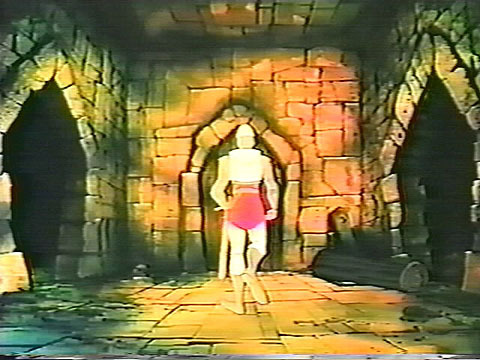 The animators removed this from the normal scene, but never removed it from the crumbling bones scene. 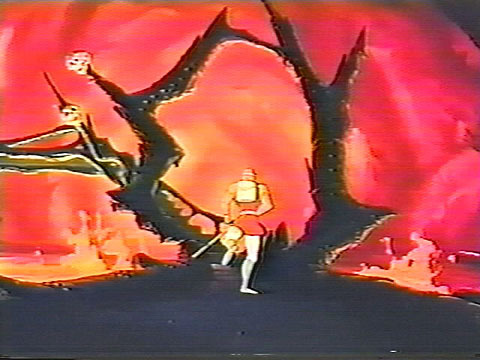 THE TENTACLES - This scene originally contained no fire at all. 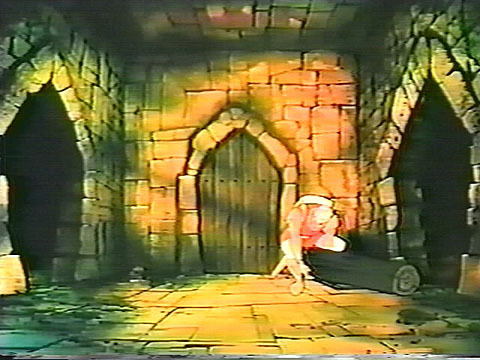 In this scene, Dirk walks into the room, looks around, and either walks out of the door in front of him or crawls out of the hole in the wall behind the bench. 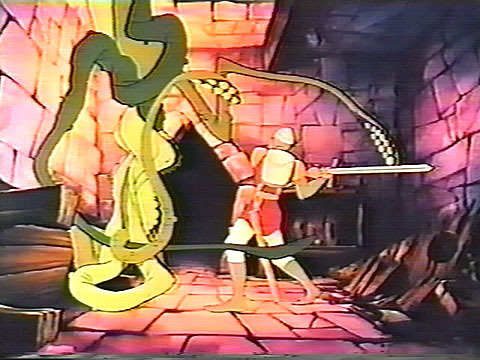 If Dirk waits around, a green tentacle monster comes out of a hole in the ceiling. 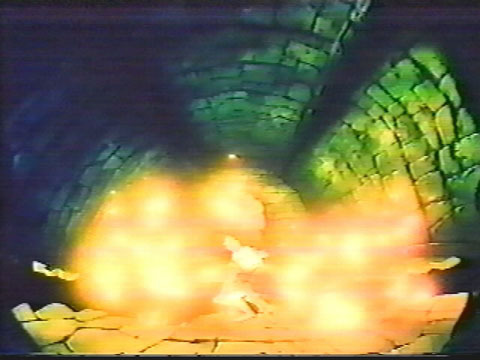 (the same hole that fire comes out of on the normal disc). 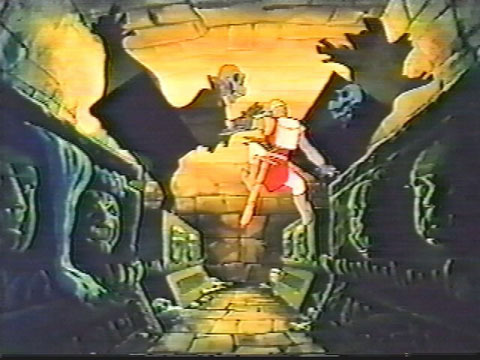 THE MAUSOLEUM - In this scene, there were no skulls jumping out at Dirk, and no skeletal hand trying to grab Dirk. 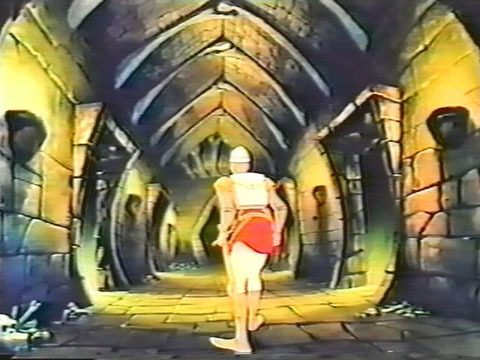 He simply walks down the corridor. 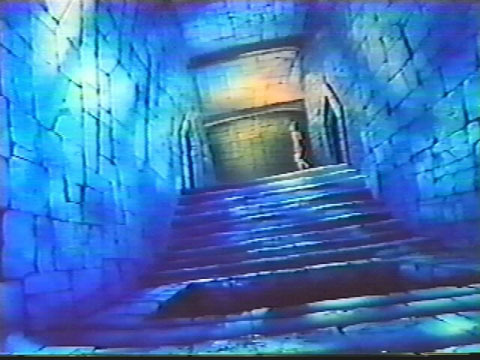 He could exit through any of the doors to the left or right while walking down this corridor, possibly finding some Crypt Creeps within. 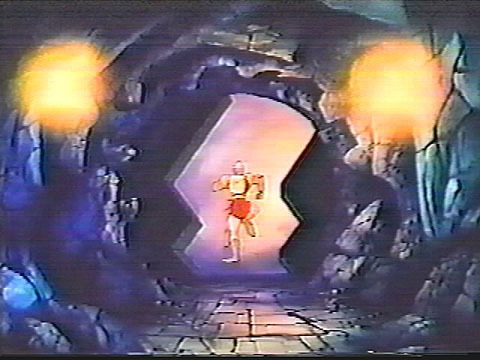 At the end of the corridor, Dirk could exit forward, through the door that is inaccessible on the normal disc. 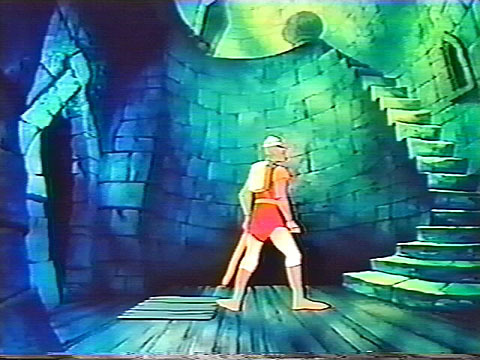 THE CATWALK - In this scene, Dirk has the option to exit immediately through a small opening to the left. 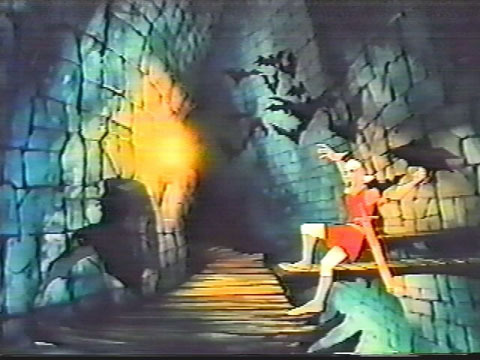 If Dirk does not jump onto the catwalk on the right, bats will come around and chase him. 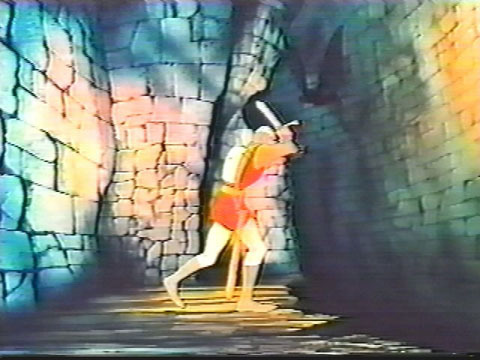 He would then leave through an altogether different doorway behind him. 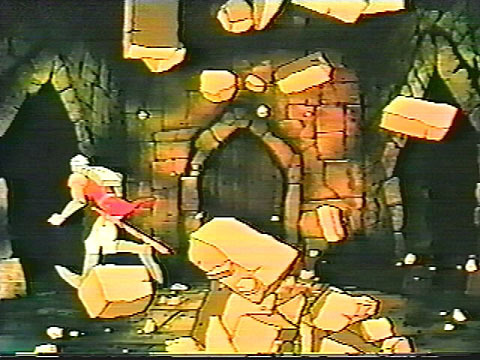 * If you look very closely at the "crumbling bones" scene on the final pressing of the disc, you will see the small opening to the left that Dirk can exit through. 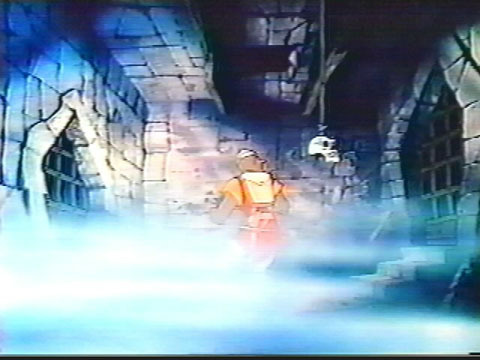 The animators removed this opening from the normal scene, but never removed it from the crumbling bones scene. 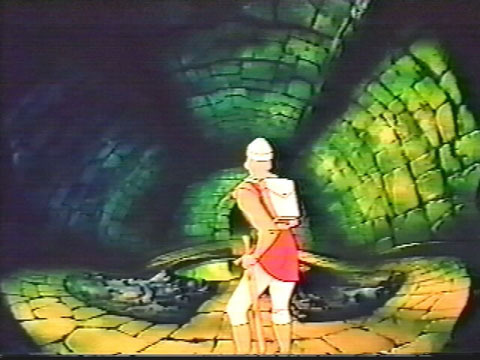 THE YELLOW BRICK ROAD - In this scene, Dirk has the option of going either left, right, or forward. 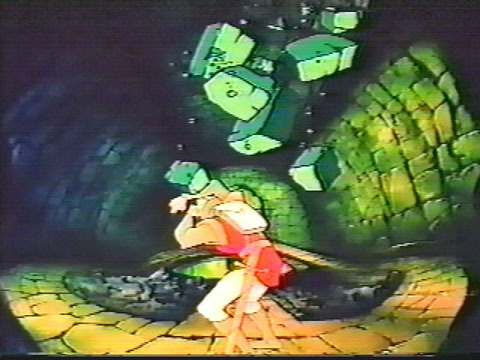 If Dirk does not move quick enough, the ceiling crumbles down and kills him. 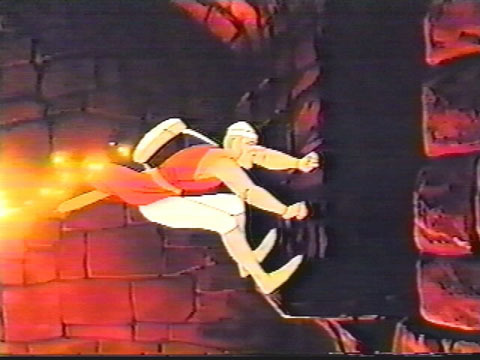 Before jumping into the pool of water, Dirk must first jump through a wall of fire. 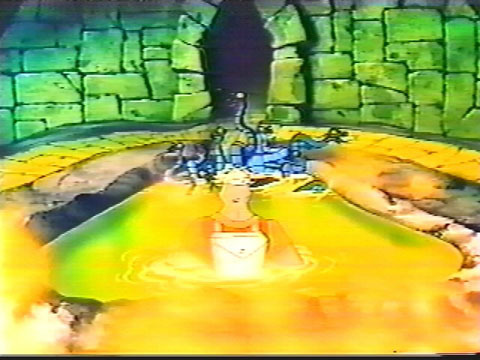 Upon leaving the pool of water, Dirk has the option of going either left or right again. 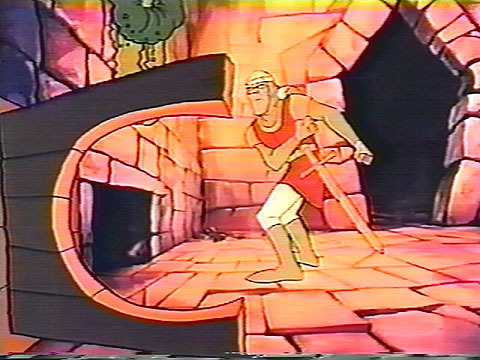 Dirk now meets up with the spider, but does not kill it. 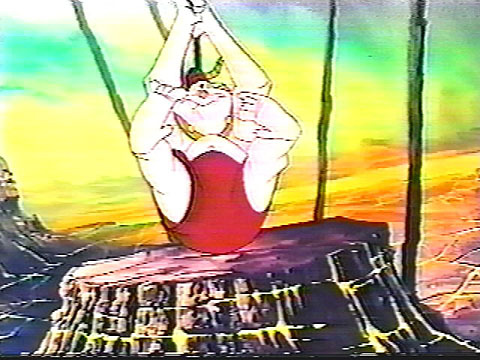 Dirk jumps over to the raising platform, where he is met by yet another spider before exiting the scene. 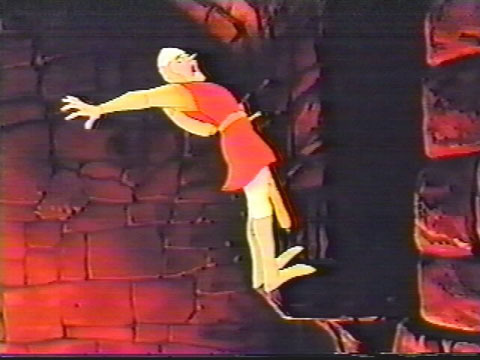 * The last picture shown here is one of the death scenes that shows a knife going into Dirk's back. 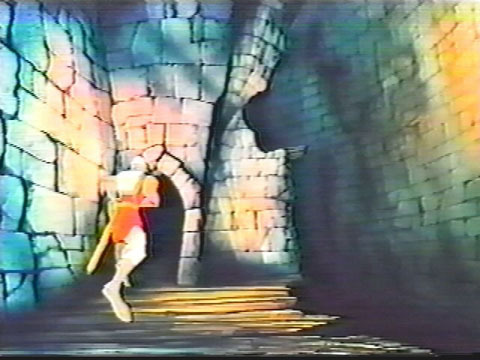 If you look very closely at the same death scene on the final pressing of the disc, you will see the knife coming up to Dirk's back, but right before the point of entry, the knife disappears. 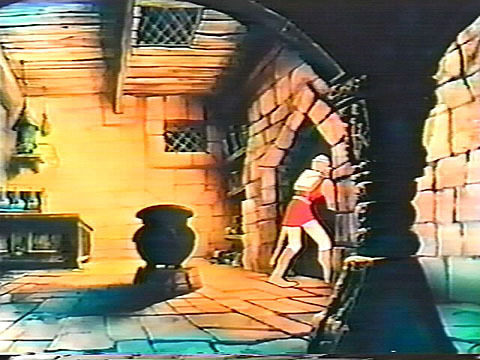 One can speculate that this death scene was too graphic, and so the knife was removed before entry. 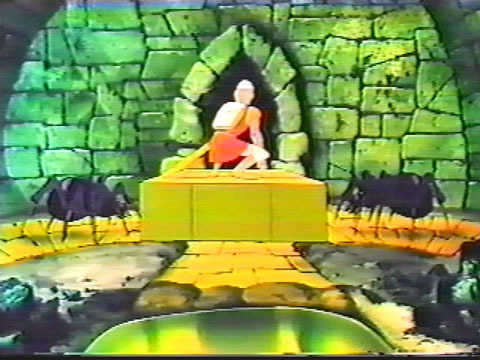 THE FIRE PIT - Other than the absence of any trumpet fanfares, there are no noticeable changes in this scene. 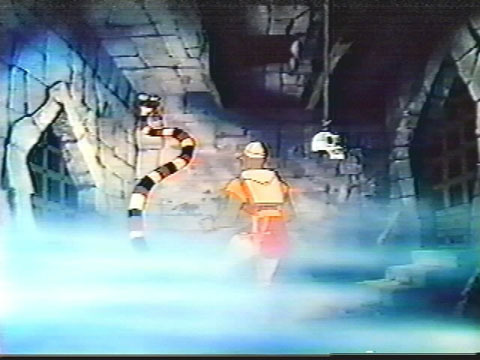 MIST ROOM - In this scene, there is only one snake that attacks Dirk. 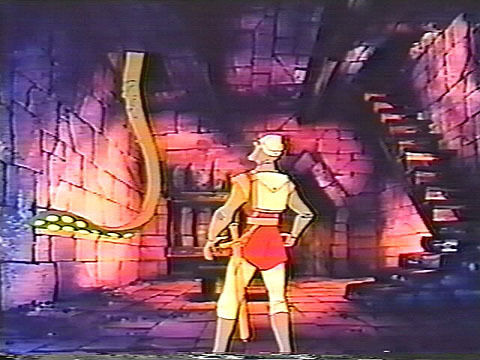 There is no snake that comes out from the ceiling. 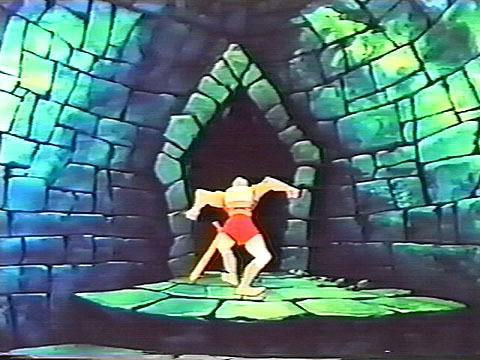 THE YMCA ROOM - As Dirk enters this room, there is another doorway visible on the left side. 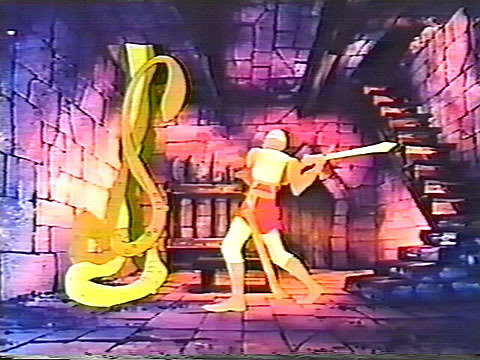 The stairs do not flatten here, and no Cyclops Worms attack Dirk from the pit. 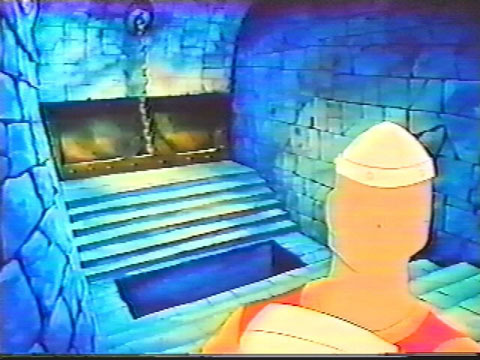 The stairs on the other side of the room flatten when Dirk reaches the top. 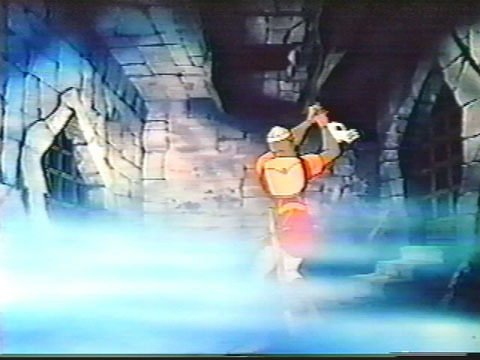 There is an extra death scene here, where Dirk tries to grab the chain but misses and falls to his death. 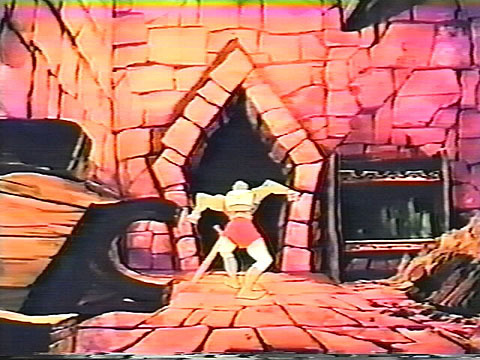 * If you look very closely at the "crumbling bones" scene on the final pressing of the disc, you will see the extra doorway on the left side of the screen. 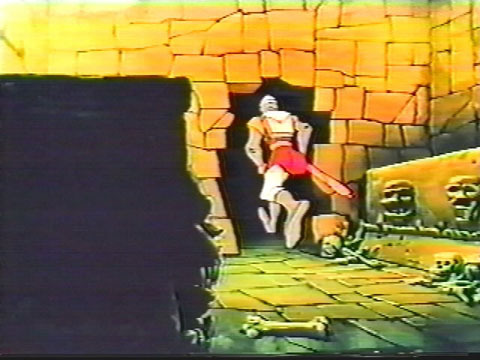 The animators removed this door from the normal scene, but never removed it from the crumbling bones scene. 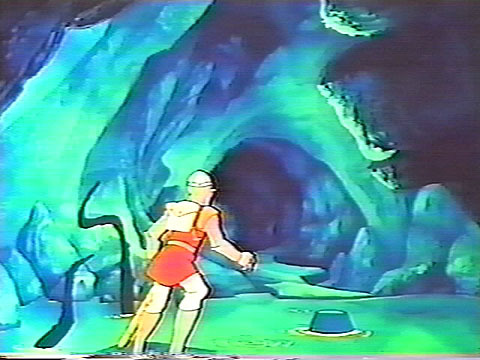 THE THREE CAVES - At the beginning of this scene, Dirk has the option of going either left, right or forward. 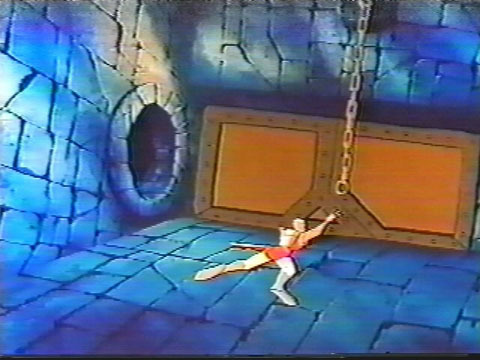 There is no cage that comes down from the ceiling. 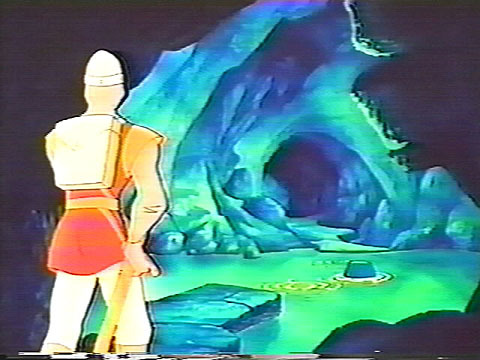 Moving left will take Dirk to the lava geyser area. 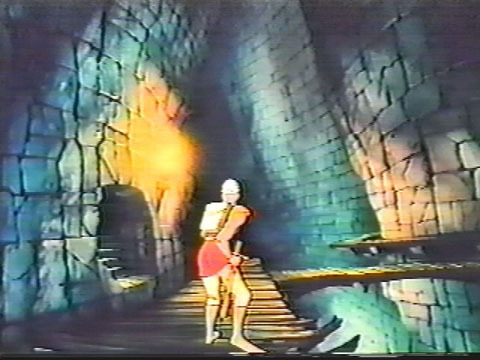 Once Dirk crosses the bridge, the scene ends. 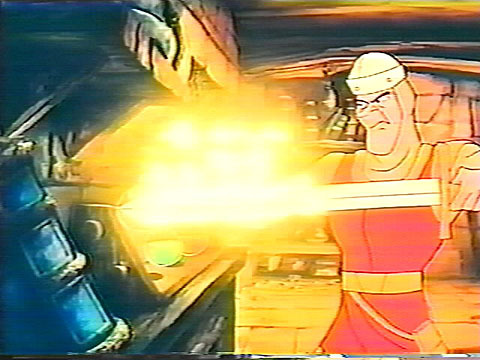 Moving right will take Dirk to the water area. 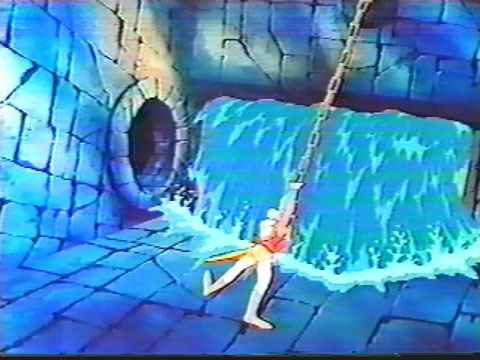 Dirk must jump across the stones without getting caught by the water monster that awaits him. 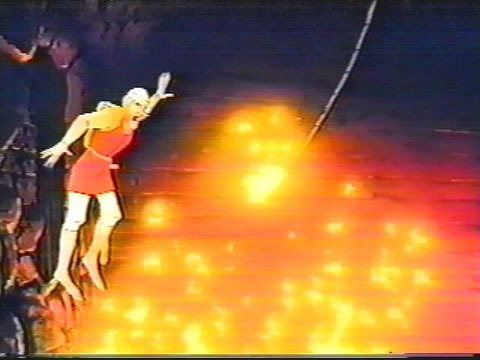 Once Dirk crosses the water, the scene ends. 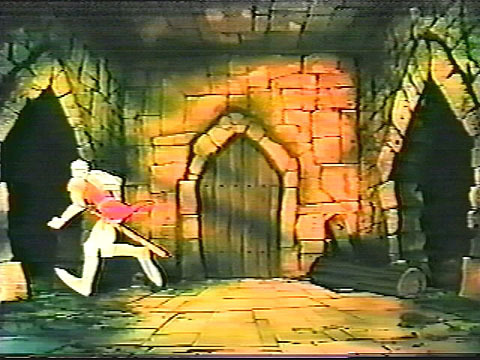 Moving forward will take Dirk to the jagged door. Once Dirk jumps through the door, the scene ends. 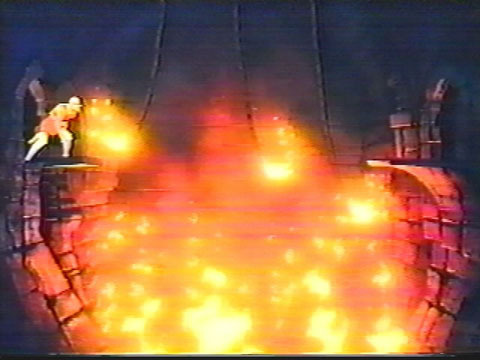 * If you look very closely at this scene on the final pressing of the disc, right before the metal cage comes down, you can see the caves to the left and right. 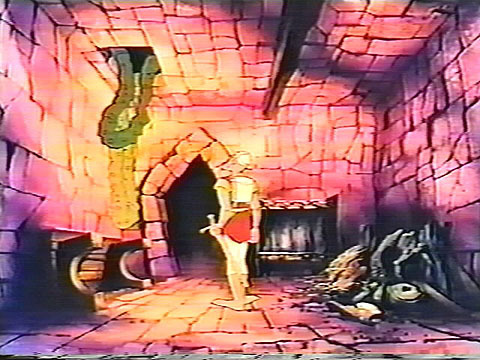 For your viewing enjoyment, we have included some mpeg files of the above scenes. 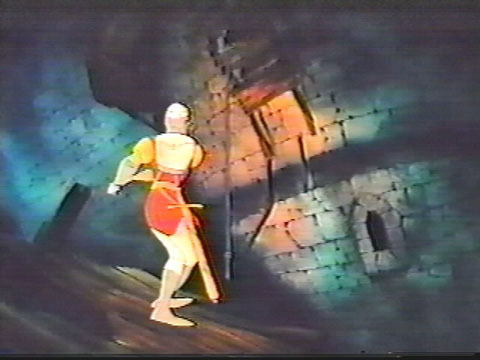 UPDATE: All of the above prototype video footage was added to the limited edition Dragon's Lair reproduction laserdisc that was pressed in 2002. 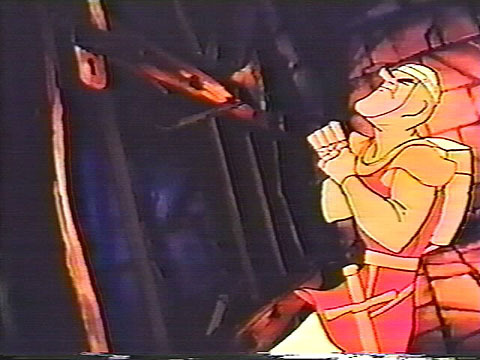 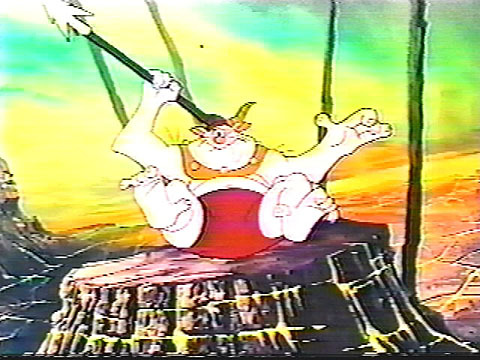 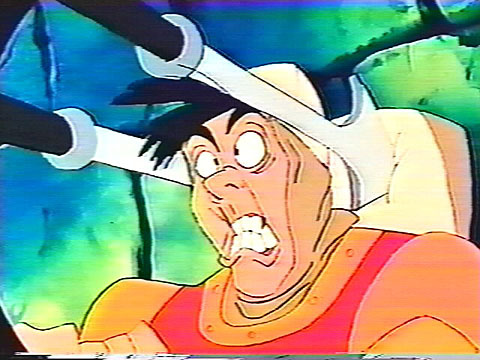 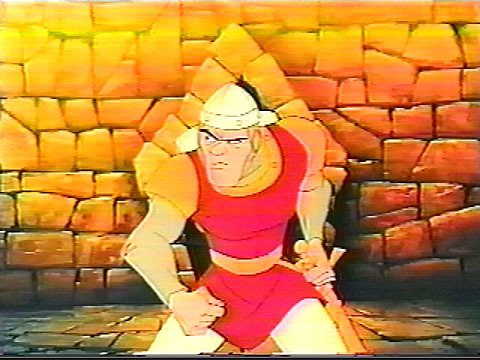 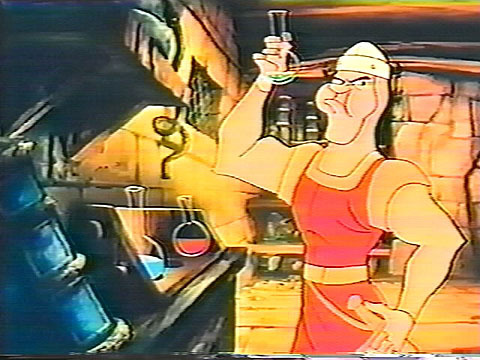 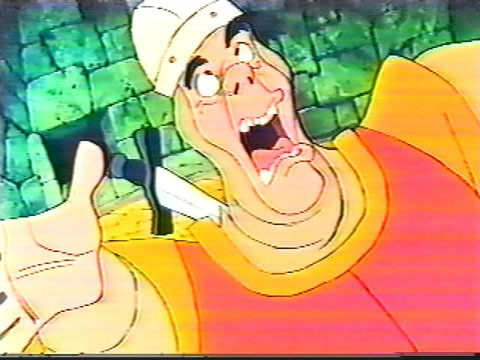 The footage is also included with the Dragon's Lair laserdisc image for the Dexter laserdisc replacement product. 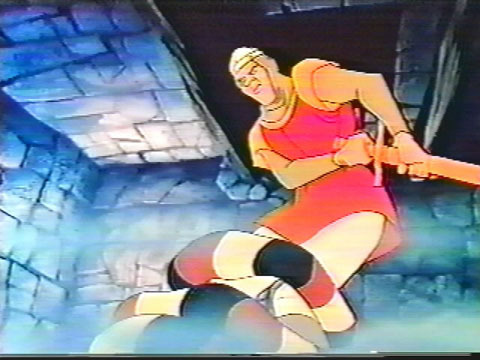 When either is used in a Dragon's Lair arcade game with the latest Dragon's Lair Enhancement ROMs, these scenes can be played.